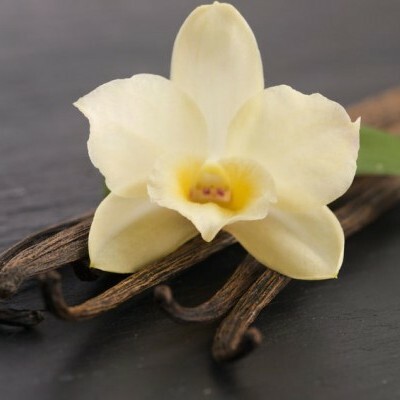 Vanillin is the primary component of the extract of the vanilla bean. Vanillin is the primary component of the extract of the vanilla bean. It is used as a flavoring agent in foods, beverages, and pharmaceuticals. It is a phenolic aldehyde, an organic compound with the molecular formula C8H8O3. The history of vanillin begins with Cortez, the famous Spanish conquistador, who is said to have been served a chocolate drink flavored with vanilla by the Aztecs around 1520. He brought the knowledge of both chocolate and vanilla back to Spain and Europe, where they rapidly became popular. Gobley, in 1858, was the first to isolate and identify the vanillin constituent of the vanilla bean and to confirm that this was the chief flavor environment. The vanilla aroma was so popular that in 1875, less than 20 years from its initial isolation, synthetic vanillin became available in France and the Unites States. 1 Vanillin was first synthesized from eugenol, which is the essential oil from cloves, then lignin and then guaiacol. Currently, around 20, 000 tons are produced per year. The worldwide production of natural vanilla extract is 40 to 50 tonnes per year, which represents less than 1% of the total vanillin production.1 Vanilla beans are harvested from species of the Vanilla orchid, a tropical climbing plant grown in Mexico, Madagascar, Java, Reunion, and Tahiti. Each vanilla orchid must be manually pollinated to attain reasonable yields. Hand pollination is very laborious and discourages the cultivation of these plants at a very large scale. The cured vanilla pods have vanillin at a concentration of 1.0-2.0% w/w.3 When vanillin is produced from vanilla beans by this process, the labelling on the consumer product maybe indicated as “natural vanilla flavor”, which is a powerful marketing argument. Increased environmental concerns toward the caustic effluent of the process. Decreased lignin availability due to the increasing use of the Kraft process for pulping, in which lignin is burnt to produce energy. The rise of cheap chemical intermediates from petroleum. Fache, Maxence, Bernard Boutevin, and Sylvain Caillol. “Vanillin Production from Lignin and Its Use as a Renewable Chemical.” ACS Sustainable Chemistry & Engineering ACS Sustainable Chem. Eng. 4.1 (2016): 35-46. Sinha, Arun K., Upendra K. Sharma, and Nandini Sharma. “A Comprehensive Review on Vanilla Flavor: Extraction, Isolation and Quantification of Vanillin and Others Constituents.” International Journal of Food Sciences and Nutrition 59.4 (2008): 299-326. Rao, S. Ramachandra, and GA Ravishankar. “Vanilla Flavour: Production by Conventional and Biotechnological Routes.” Journal of the Science of Food and Agriculture 80.3 (2000): 289-304.